Dear Baskin-Robbins, why is it so hard to have the flavor of the month in stock? You don't have it at the beginning of the month*. You don't have it at the end of the month. This is why I don't do more Baskin-Robbins reviews. That said, there was someone waiting at the counter for me when I walked in, so rather than sneaking out like I've done on a few other occasions, I decided to ordered a double scoop so I could try two more of their "Made with" flavors. For the record, I tried the Milky Way version awhile back but unfortunately June's Made with Twix was never available when I would stop in. As for this trip, they no longer had July's All About Oreo and I wasn't looking for August's Oreo Cheesecake. Uggg. Too complicated. Anyway, thankfully my scoops came from the top of fresh containers for both flavors. Made with Snickers was loaded with tasty caramel sauce as you can see, but I never really hit any big Snickers bits. It was fine but there wasn't enough chocolate factor to get a good candy bar vibe. On the flip side, my particular scoop of Made with Reeses was loaded with huge chunks of peanut butter cups and it was delightful. Those big bits were easily the highlight of this double scooped adventure. For several of my scoops, I was scooping some of the Snickers caramel with some of the Reese cups and they unsurprisingly went well together. My only real thought while trying these two flavors was whether I would prefer two scoops of Reese's or was I having more fun mixing the two. No idea how long these two will be around, but feel free to try them. Disclaimer: Just like DQ, your mileage may vary. *Note: in the interest of fairness, there is the possibility that the Oreo Cheesecake flavor was out and I just didn't recognize it as the new flavor of the month. 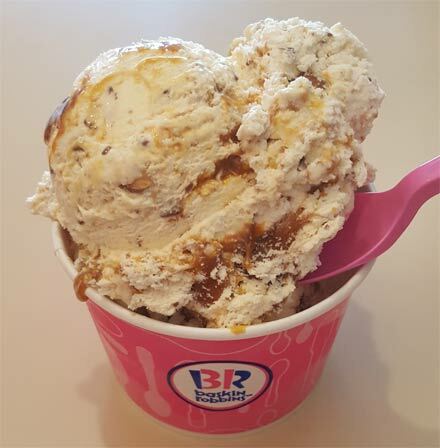 Made with Snickers: "Buttery, caramelly ice cream with Snickers, swirled with a caramel ribbon"
Made with Reeses: is this a new name for their Reese's peanut butter cup ice cream? All About Oreo: "fudge covered, peanut butter, and classic OREO cookie pieces all combined with an OREO® frosting ribbon in rich chocolate malt ice cream"
Oreo Cheesecake: "OREO cookie pieces, cheesecake pieces, and a chocolate cookie crumb ribbon collide in cheesecake flavored ice cream"
I am getting bit annoyed with BR "flavor of the month" because for two months now the flavors is oreo themed. "All about oreo" and now "oreo cheesecake". I like oreos but come on. It's too much. Need to change to different flavors. Maybe sweet tea ice cream or Arnold palmer sherbet with lemonade and iced tea flavors meshed. HAHAHAHA, that's true, most of my more recent Baskin-Robbins reviews involve Oreos. Four with OREO in the name and a fifth that had Oreos mixed in. Of course they went well together. A Nutrageous bar is basically a fusion of the two candies. Does anyone remember a Baskin-Robbins flavor from a very long time ago called "Mandarin Chocolate"? There's never been anything like it, it was so chocolatey it was almost black. It was seasonal and then never came back to my knowledge. so the internet tells me that "Mandarin Chocolate Sherbet" was a mixed of chocolate and mandarin orange and available in the 2000-2001 time frame, sound right? Maybe it was just too early for it's time. Mandarin Chocolate was my favorite in 70's & 80's made a come back for short time in 2000-ish. Tasted like a more orange version of Terry's Chocolate Orange candy. NEED it now....miss it like an old lover.